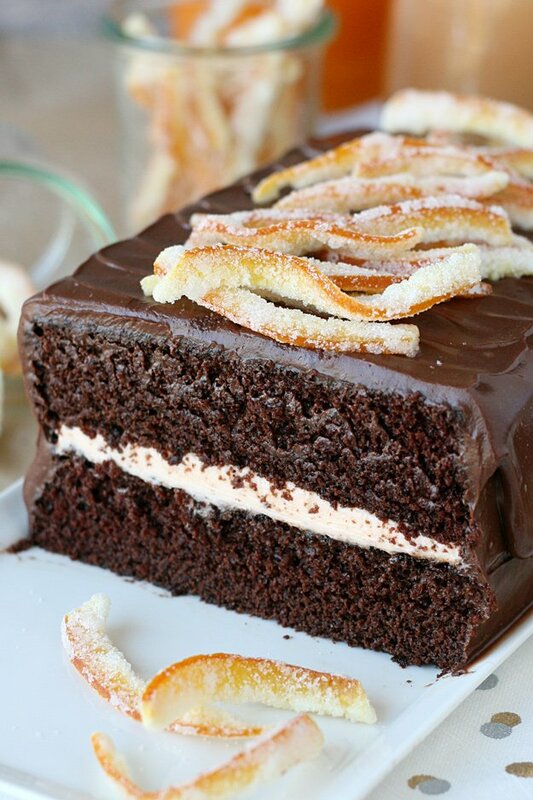 This Chocolate Orange Cake is rich, flavorful and simply beautiful! This cake would be an elegant and delicious finale to any holiday meal! After I shared the recipe for Candied Orange Peel earlier this week, I wanted to follow up with an idea for using that delicious candied peel. This Chocolate Orange Cake balances rich chocolate with the sweet, bright notes of orange. I thought the elegant pairing of chocolate and orange deserved a special presentation too, so I turned a 9″x 9″ cake into a rectangle, just for something a bit different. The smaller scale of this cake is perfect for a small dinner party, or anytime you don’t need a huge cake. This cake starts with my favorite Chocolate Cake Recipe, simply scaled down. 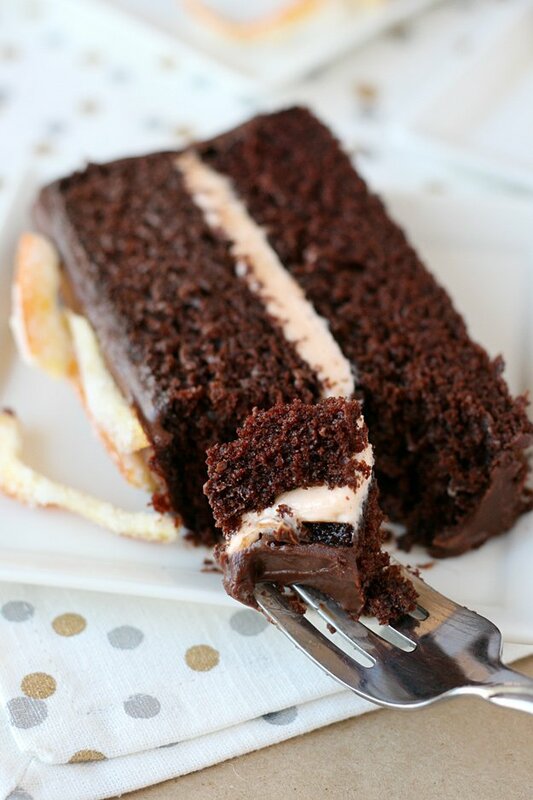 The cake is fluffy and moist, with a rich chocolate flavor. As the cake cools, I brushed the top of the cake with Grand Marnier orange liqueur. This step is optional, but adds a nice depth of flavor. The filling is where the orange flavor comes in again, with a simple, creamy, orange buttercream. 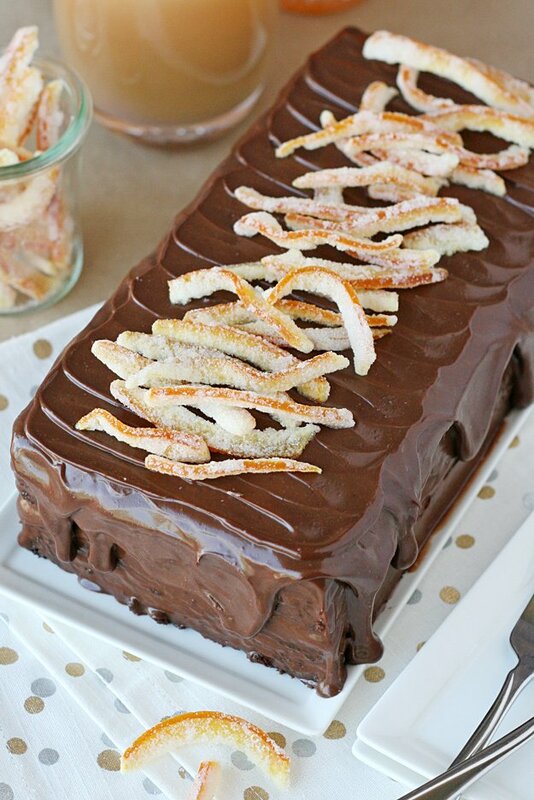 Finally, the cake is covered in a classic chocolate ganache and gets dressed up with the pretty Candied Orange Peel. If you’d like to give this recipe a try without the additional steps of making the candied orange peel, I might suggest adding a bit of Grand Marnier (1-2 teaspoons) or orange extract (1/4 to 1/2 teaspoon) to the chocolate ganache. For a pretty garnish you could add some chocolate curls or a thin piece of fresh orange peel. 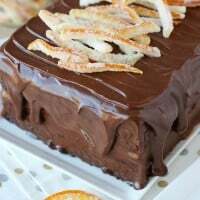 A rich, moist chocolate cake is accented with a creamy orange frosting, then finished with a classic chocolate ganache and candied orange peel. 1. Pre-heat oven to 350*F. Line a 9"x 9" cake pan with a piece of parchment paper, leaving a bit of an overhang (so you can pull out the cake after it's baked). Lightly butter the two sides of the pan not covered by parchment. 2. In a large bowl, whisk together sugar, flour, cocoa powder, baking powder, baking soda and salt. 3. Add egg and whisk to combine, then add milk, oil and vanilla and stir well. 4. Add hot water (or hot coffee) and blend until fully incorporated. The batter will be very thin, this is right. 5. Pour batter into prepared pan and bake 22-28 minutes, or until a toothpick inserted into the center of the cake come out clean. 6. While the cake cools, use a pastry brush to brush the top of the cake with the Grand Marnier. 1. In the bowl of an electric mixer, blend the soften butter until smooth. Add cream cheese and blend until fully combined. 2. While mixing, slowly add powdered sugar, then extracts. Add a drop of orange food coloring, if desired. Blend until smooth. You may need to stop the mixer and scrape down the sides. 1. Chop chocolate, or use good quality chocolate chips, and add to a medium bowl. 2. Heat cream in the microwave until hot, but do not let it boil. 3. Pour hot cream over chocolate and allow it to sit, undisturbed 1-2 minutes. 4. Stir until smooth, then move to the fridge to firm up a bit. 1. Remove (fully) cooled cake from the pan by pulling up on the exposed parchment paper. 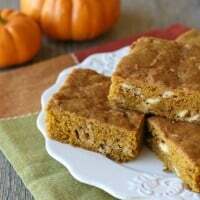 Place cake on a cutting board. Cut cake in half, so that you have two 4.5" x 9" rectangle pieces. 2. Move one of the pieces of cake to a wire cooling rack with a baking sheet under it (this will be needed shortly, when frosting with ganache). 3. Spread the orange frosting onto the cake (on the cooling rack), using an offset spatula. Top with the second piece of cake. 4. Check on the ganache, it should be thickened slightly, but still pour-able. Pour some of the ganache onto the cake and use an offset spatula to spread it down the sides of the cake. Once the cake is covered with a thin layer of ganache, move the entire cake (on the rack) to the freezer for 5-10 minutes to allow the ganache to set up a bit. 5. Once the first layer of ganache has set, use 2 large spatulas to move the cake to a serving platter of your choice. Pour a second layer of ganache over the cake. You will need to experiment with how thick or thin you want the ganache. You can chill it in the fridge to thicken, or microwave (on 50% power) for short periods to thin it. For my cake the top layer of ganache was thick enough that I was able to add some texture to the very top of the cake with an offset spatula (spreading from side to side). 6. Garish generously with Candied Orange Peel. For the best flavor, be sure to use pure extracts and good quality cocoa powder and chocolate. Glory, this cake is absolutely BEAUTIFUL!! That candied orange on top — OMG!!! 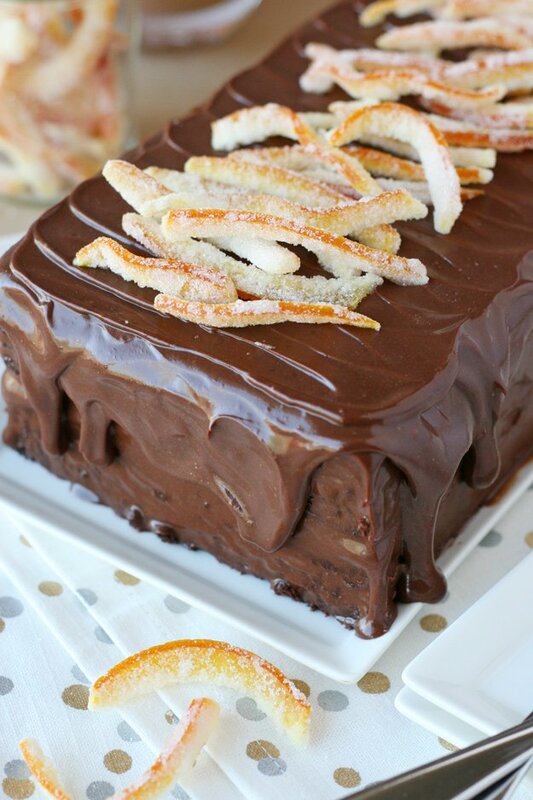 Chocolate and orange is a great combination! Yummy looking cake! Thanks so much Medeja! I hope you give it a try! This looks fabulous! Thanks so much for all your recipes. I read all the time but don’t comment much. My favorite thing is orange creams. I can’t wait to try this. You don’t find many orange/chocolate recipes. Thanks so much for the sweet comment Susan! I really appreciate hearing from my readers, it’s so nice to know I’m not talking to myself! =) So glad this appeals to you, I hope you give it a try! So pretty! Looks like a great idea for that candied orange peel! The Grand Marnier sounds like the perfect touch! How I wish I could reach in and grab that bite on your fork there! this looks so yummy! Chocolate and orange is one of my favorite combinations. 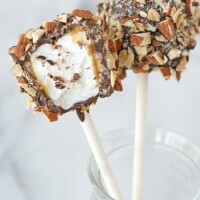 I’m going to have to make this for my birthday which is next week. i don’t mind making my own birthday cake, because then I get exactly what I want! ha ha! 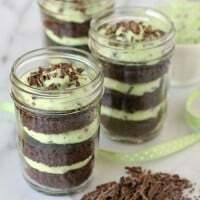 This looks delicious and very easy actually! But one question: What can I substitute the orange extract with ? But if you don’t like orange – maybe a raspberry extract with a raspberry letter instead of the Grand Marnier. Hi Glory! Love your blog! In the Orange Chocolate cake recipe, what kind of flour to use? All purpose? This looks amazing!!! I wish i could have a piece right now! So decadent! I’m a big fan of chocolate and orange! I did my best with this. Less pretty in presentation cause my skills aren’t as high. But instead of candied orange peel as garnish I did orange flavored sugar decoration instead. Which I thought looks pretty good. Fantastic recipe. Thank you. Add me to your email list. Thanks! Will definitely try. Pks add me to your list. Tks! I love the idea of using candied orange on top of the cake, it looks so pretty there! And the whole cake sounds fabulous! 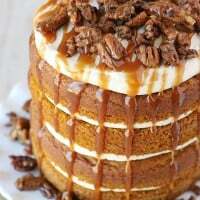 Will this cake work as a two-layer round cake (9″ rounds)? Made this cake for my husband’s birthday yesterday and it was liked by all. 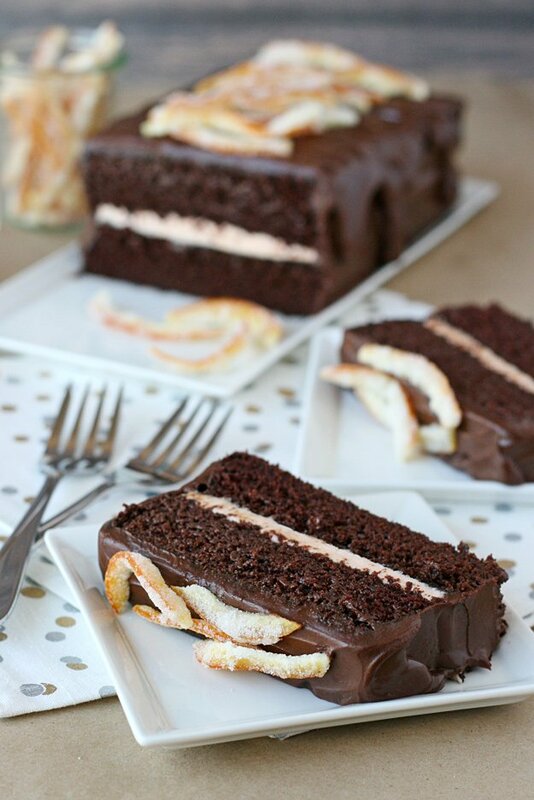 Really moist cake and extremely good combination of orange, coffee and chocolate. Couldn’t find orange liqueur and hence used rum and orange juice to moisten the cake in between layers. Thanks for the great recipe. I’ve done couple times and always comes out delicious. Thanks so much! I really love hearing that! Yay! Thanks so much for the sweet comment! I’m so glad everyone enjoyed it! This cake was delicious. Firstly the combination did not caught my attention, but a Friend asked me to do It for her. Everyone loved It. Is so moist and rich in chocolate flavor. I didn’t use the grand marniere, instead I use fresh Orange juice, and for the crean cheese filling too. I made this …turned out delicious and easier than I thought it would be. i ended up chilling the ganache and using it more like a frosting instead of pouring it. I added Grand Marnier to the ganache and skipped the candied orange peel. Just adding that ‘i doubled all the quantities and made a huge round 9 inch cake! Thanks so much for taking the time to leave a sweet comment! Your cake sounds amazing! So glad you enjoyed the recipe! I’m going to make this cake for my granddaughter who will be turning 16 on Christmas Day. I too love the combination of orange with chocolate. Chocolate cookies I make at Christmas, I use orange extract along with orange bits.